People get tattoos for a wide variety of reasons. Some have emotional significance, while others might commemorate a certain special event – and then there are those that may have seemed like a good idea at the time but are now regretted. If you’re seeking laser tattoo removal for an unwanted tattoo, make an appointment with one of the clinicians at our tattoo removal clinic in Canberra. How Does Permanent Tattoo Removal Work? The Laser Skin Clinic offers two services for people unhappy with their tattoos. You can either have it faded so it can be easily modified at a later date, or you can undergo a permanent tattoo removal procedure. The latter option will generally require at least 10 laser treatment sessions to achieve complete results; however, amateur tattoos, tattoos comprised of black ink, and tattoos that only need to be faded for future modification will generally require less than 10 sessions. 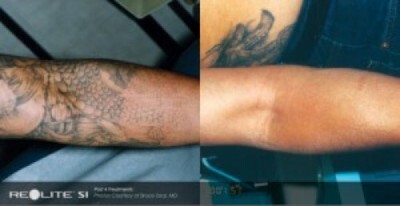 Laser tattoo removal works by using intense heating from a Q-switched laser to disintegrate the ink particles in the tattoo. The body’s immune system naturally disposes of the broken down ink, emulating the natural fading action that would otherwise be left to the energy of the sun. After 6 treatments with the RevLite laser. The Laser Skin Clinic uses the state-of-the-art RevLite™ medical grade Q-switched Nd:YAG and KTP lasers, widely considered to be an industry leader. At present, the Laser Skin Clinic is the only provider of tattoo removal in Canberra that owns this laser. Developed by Hoya ConBio, Q-switch laser tattoo removal technology is renowned for being significantly less painful and more efficient than laser based tools of years gone by. Higher end models typically present better results and reduced risk to the patient as well, due mainly to the level of care and consideration invested in their manufacture. The RevLite™ allows tattoo removal professionals to choose from four different Q-switched laser wavelengths, enabling our staff to be able to successfully fade or remove a much wider spectrum of colours beyond the standard black. Should you be seeking laser tattoo removal in Canberra, we require you first come in for an initial consultation which is free of charge. At the consultation, we will discuss your requirements, inform you of the process, run through tattoo removal prices, and assess your suitability for treatment. Prior to the tattoo removal procedure, the area may be anaesthetised to make the treatment as comfortable as possible. The actual treatment time might be as little as minutes for a small tattoo. The tattoo may appear frosted and be slightly raised immediately after treatment. Additionally, the surrounding skin may be red. To book an appointment or to find out more about the cost of tattoo removal, click HERE.